Small Logistics Fulfillment: When Is It Worth It? It’s a no-brainer for large and busy companies to partner with logistics and fulfillment solutions centres to store and ship their goods by truck, air, rail, or water. However, deciding whether or not to process your own orders is a much more difficult decision for small business owners with limited cash. While there are many benefits to working with a third party logistics provider, outsourcing fulfillment isn’t right for every business owner, nor every type of business. If your small hobby-turned-business is running smoothly and sales are consistent, it would likely be wasteful for you to work with a large logistics provider. Without high demand, keep the purchasing process simple and work one on one with those interested in your product. Logistics providers can offer insight and options into worldwide shipping. However, if most of your customers are local to the area you work out of, having access to these options isn’t necessary. You can either drop off the purchased item, have the buyer come to your home or office to retrieve it, or send it by local post. If your small business is making just enough to get by, it is not a smart financial move to hire a third-party logistics provider. In cases where profit is low, it is much more cost effective and convenient to package and ship items yourself. If you are a person who makes customized goods – such as jewellery sold on Etsy, it does not make sense to work with a logistics provider. As each of your products needs to be individually crafted, packaged, and shipped in a unique way, creator-to-buyer shipping is ideal. Controlling your entire shipping process allows for flexibility and for you to focus on any unique packaging you wish to have (tissue paper, bows, boxes, design, etc.). This will make the buying experience more personal for your niche clients – as they will know you packaged and sent their item yourself. For small businesses looking to expand, working with a third party logistics company can seem overwhelming. However, the move to working with a logistics provider may be the most strategic and important step you make for your growing company. If your company has hit a growth spurt, it is time to start planning ahead and to consider what the next year (or next five years) might look like. As part of this discussion, you’ll need to strategize how you will keep up with demand, store product, and ship to even more countries as your reputation grows. As sales increase, it can become harder to manage your finances and the many different packages that you are sending out. Therefore, as you begin to make more and more money, you’ll not only need to consider partnering with a company who can reduce your management stress, you’ll have the funds to do it! If your product has become so popular that you’re struggling to fulfill orders quickly and on time, it’s time to talk to a third party logistics company that can streamline your order process, track your items, and ship out product with ease. This will help to increase customer loyalty, as people will receive their purchases in a timely and reliable matter. Most start-up business owners begin their ventures from their own homes, allowing boxes of product to pile up in their basements, garages, or offices. However, as more product needs to be stored, it’s important to find an accommodating space that will allow for proper temperature conditions, protection from contaminants or weather concerns, and more. By working with a third party shipping and logistics centre like McKenna, your product will be stored and coded on skids that can be picked and shipped at any time. With a vast amount of warehouse space, any specific needs can be accommodated. With business growth comes larger and further demand of product. While your business may have once been limited to Ontario, a logistics provider can help you to strategically extend your reach to the United States, China, and beyond. Logistics partnerships are also ideal for those looking to enter new markets and countries (including coming to Canada), as most companies require support when managing international shipping regulations and requirements. Flexible and knowledgeable about seasonal increases in product purchasing and shipping around the holidays, logistics providers can make a plan that will adapt to the needs of your busy season. In other words, if you need more warehousing space from September to January, a trusted logistics provider will be able to adapt alongside you. However, goods such as paper products, furniture, metal products, and many other products also make the list. To learn more about how we can offer the right shipping solutions for your business, please have a look at ‘Our Approach to Logistics’. 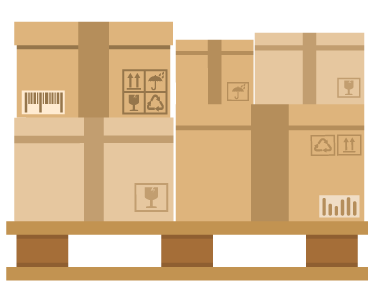 Through competitive advantages, KPIs, leadership, and charitable initiatives, we’re your best choice when it comes to increasing the packaging shipping productivity of your company. Call us at 1-800-561-4997 or send an email to sales@mckennalogistics.com to get started today!